Trophies of Victory! Bring the Trophy Home! The word trophy means something different to each of us. Trophies are reminders and evidence of achievement or merit. Sometimes extraordinary achievement! 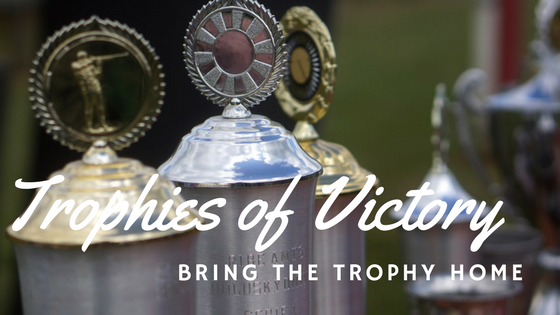 Today children are often given trophies simply for participating, regardless of their effort or achievement. When I grew up, awards were rare! The process of effort, defeat and success moved one to the place of excellence and recognition. In our family, we have hunters and fishermen searching for the big one, athletes working to excel in sports, diligent scholars achieving academic excellence, race car drivers, musicians, writers and artists. Many have received trophies; their efforts are worthy of acknowledgment. None of these qualities are in my bible reading today. Initially, we don’t know much about our trophy winner except he was insignificant to his father and despised by his brothers. Samuel came to anoint God’s choice for future king. Jesse brought each of his sons to Samuel except for his youngest. David remained in the fields “tending the sheep“, until Samuel insisted on seeing him. Anointing matters! Whether playing his harp before the king or during the long nights watching the sheep, Holy Spirit was with David in a powerful way. David wouldn’t allow either the stealth or fierceness of lion and bear to rob him of his lambs. Both he “seized by the hair”, stuck and killed! I imagine David did not waste such opportunity! I think he skinned both and dragged them home as personal trophies of success! When he would snuggle under the warmth of the bear hide or look at the defeated lion, courage and faith would rise stronger in him. Seems gruesomely bazaar to me! When Saul talked to David after the battle, he had Goliath’s bloody head tucked neatly (or maybe not so neatly) under his arm. He wasn’t about to let go of it! Goliath’s head was a vivid reminder of God’s supernatural intervention through someone who was “little more than a boy.” It remained a trophy of God’s ability to completely silence the enemy! Immaturity and inexperience are never disqualifiers for God’s team. Faith is the only requirement! David was not focused on His own ability or inability, but rather on Who God is. I previously envisioned David taking only Goliath’s sword. The giant came with more than one weapon. Goliath was an experienced and fully armed opponent. The sword would be used in close combat situations, the spear was like a jousting lance. The lance had a further reach and would sometimes even be thrown. The last instrument of destruction was a javelin cinched between his shoulder blades; it could be thrown for a considerable distance. David picked them all up and took them home with him! It wasn’t enough to kill the bearer of the weapons. David made sure they would never be used against him or his people again! The enemy would no longer have access to these tools of destruction! David became skilled with every weapon the enemy had brought against him. He would be a powerful warrior and military leader. These became instruments of God’s anointed servant to bring strategic victory in battles that lay ahead. I’m not sure where you are at today. Some I know are in the midst of extreme battles of various kinds. You may feel immature and untrained to face what is ahead. We can all learn from David. In your weakness, you may feel like you are facing a giant with nothing more than a wooden staff, a handful of stones, a bag, and sling. Yet under the anointing of God, with fixed gaze upon His greatness, it is enough. Take courage and approach your adversary! God is able! When your giant falls, take the trophy home with you! ← Setting the Goal of Love – Hit the Target!